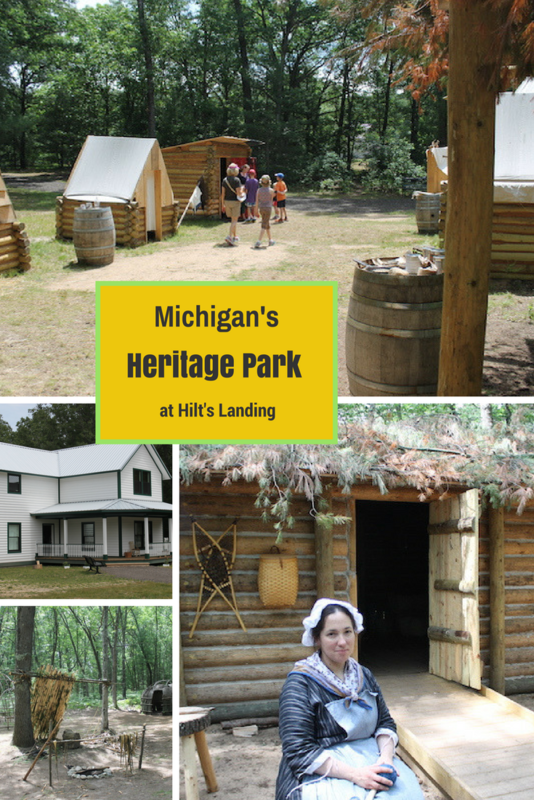 Open to the public on June 6, we visited Michigan’s Heritage Park at Hilt’s Landing earlier this week. 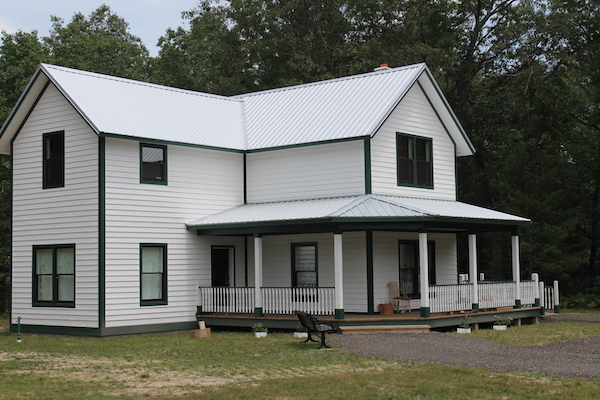 Affiliated with the Lakeshore Museum Center, the newest historic site has been under construction for some time. 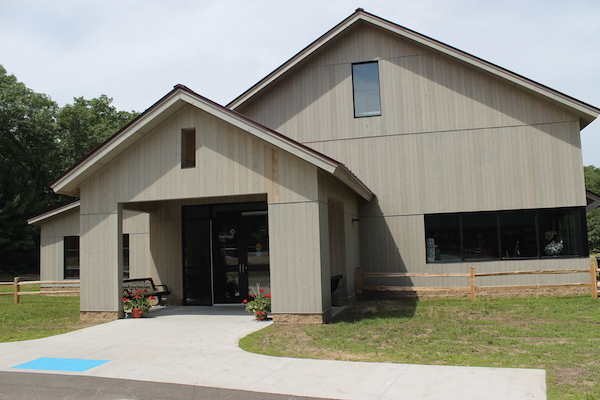 A seasonal attraction (the facility is currently open June through October), visitors to Michigan’s Heritage Park can expect a hands-on history lesson as they walk along a 1/2 mile crushed gravel path starting and ending at the barn-like Visitor’s Center. Beginning with a mastodon skeleton and ending at a 1933 CCC tent, visitors experience 10,000 years of Michigan history on a trip that took our group a full two hours to appreciate. Museum staff act as interpreters at each stop along the timeline of events; many are dressed in period clothing. 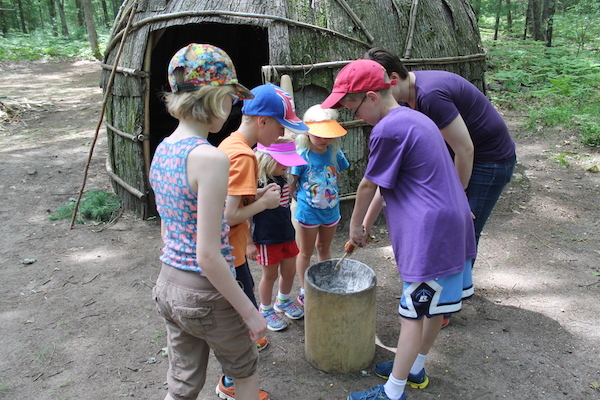 At the 1650 Wigwam Village we learned how the Ottawa Indians built their dwellings, hunted for food, and dried tree bark. Here, the kids are scraping kernels of corn from the cob using the jaw bone of a white tail deer. 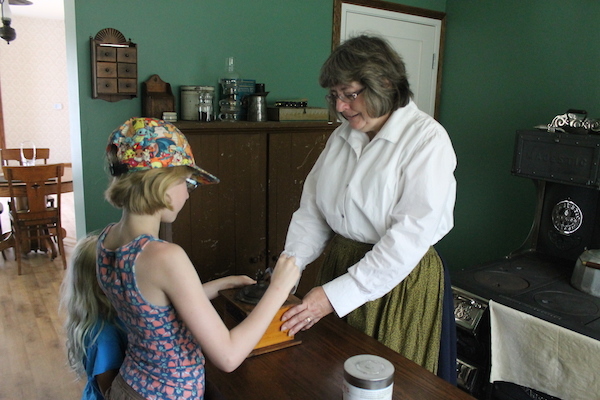 An ideal experience for elementary-age kids—many of whom are likely learning about Michigan history in the school classroom— touching is encouraged. In many cases the artifacts are true antiques. 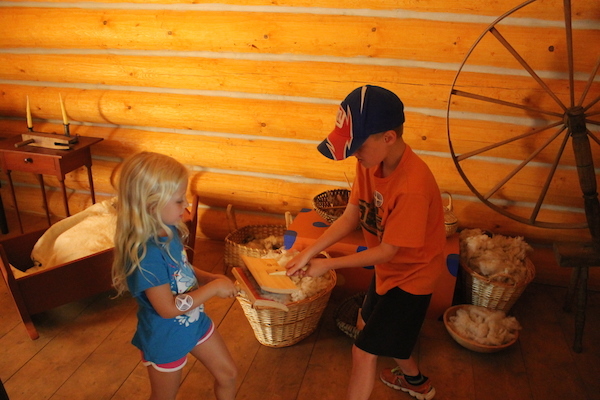 In the Fur Trader’s Cabin we held animal pelts and learned about their value as European trade goods in the 1700s. As you can see, ADA accessible ramps lead up to the entrance of each structure. 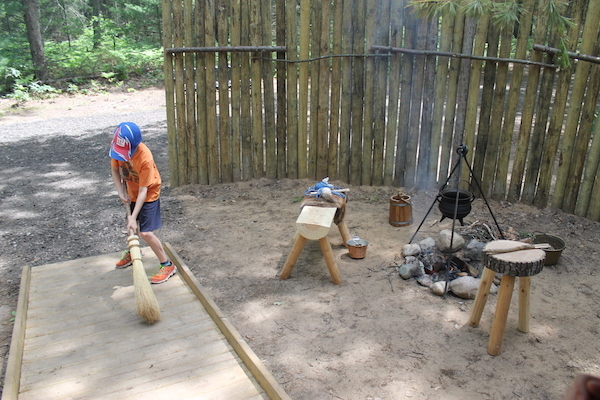 Here I wonder why my youngest son will eagerly use a broom on vacation, but claim ignorance on the same chore back home. 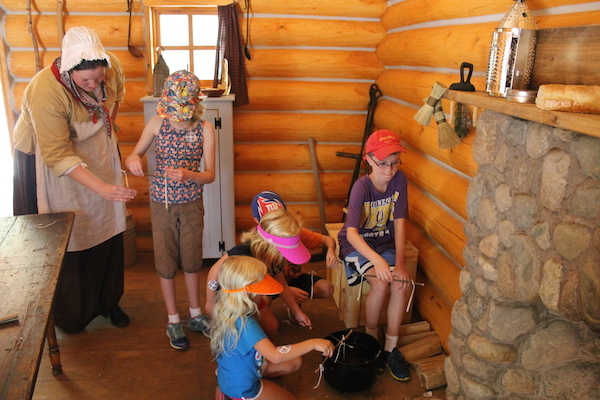 Inside the 1830 Settler’s Cabin, we made candles by dipping them in wax just melted on the hearth (none of us had the patience for the full sixty dips/candle). The Civil War Camp was an eye opener. 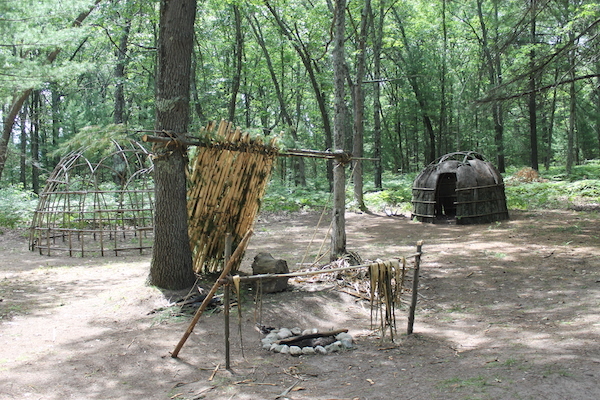 These wooden structures (left) would have been built for shelter in the winter months and it’s hard to imagine two grown men sharing a space slightly larger than a modern-day dog house. We also learned about the soldier’s diet, their uniforms, and pastimes. 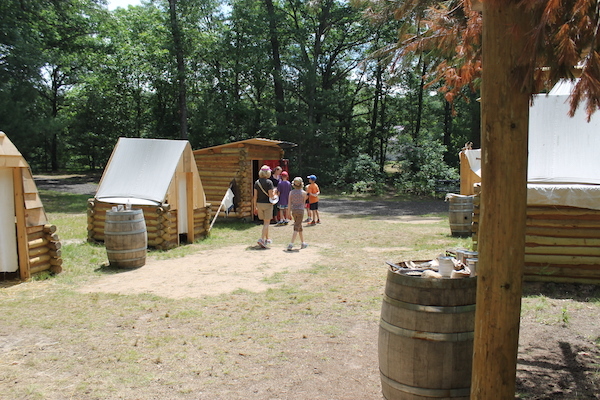 At the 1880 Logging Shanty, kids are encouraged to play checkers and climb into one of the bunk beds. Here we are marking a log with an antique stamping hammer and learning how to measure the approximate yield of board/feet of lumber per tree. At the 1900 farmhouse, we saw the beginnings of an apple orchard and vegetable garden. Inside, the kids learned to grind coffee and looked at 3D pictures through an original view finder. 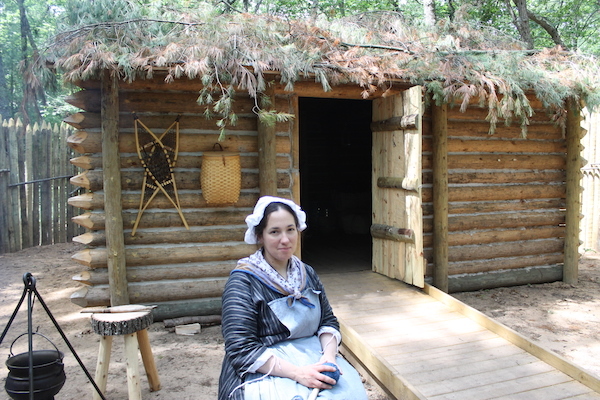 All in all, visiting Michigan’s Heritage Park was a wonderful experience. Everyone learned something new and the interpreters are both passionate and knowledgeable about their jobs. Finding the park is a bit confusing the first time; take US 131 exit 128E. Turn left (North) onto North Durham Road at the Comfort Inn. 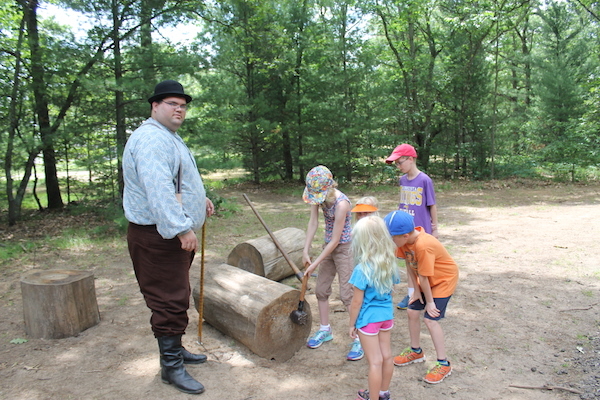 Admission to the Michigan’s Heritage Park is $10/adult, $5/kid, and $8/senior. The facility is closed Tuesday and Wednesday and is open daily from 10AM-4PM (1PM-4PM on Sunday). Much of the experience is shaded, and picnic tables are available near the Visitor Center.